The miracle of childbirth and the joy and excitement of a new member of the family are exhilarating feelings. However those first, early days of being a parent are also often filled with the stress and anxiety of having such a precious, small baby in the house. 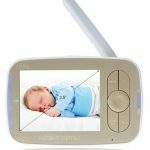 Our top pick for 2017 is the iBaby Monitor M6T. It is WiFi based, with 360-degree horizontal panning capability. The model does not come with a handset, because the video and audio all goes through a handy app on your smartphone (iOS or Android). Music – The model comes with 13 MP3 quality songs that can be played automatically via the remote app. These are high quality songs and not low-fi midi-style beeps that some lesser brands might have. Motion and Sound Activated Recording – You can set the camera to record when there is movement or when there is excess sound. 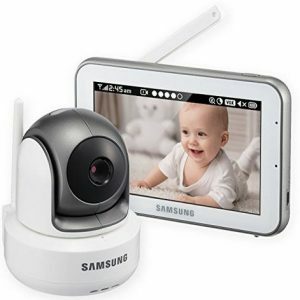 This allows you to monitor the video for events at night. Smartphone and WiFi Only – As mentioned before, the unit is WiFi based and the monitor goes through an iPhone or Android App only. This is arguably a reasonable move by iBaby, considering the ubiquitous nature of smartphones and the redundant nature of standalone handsets.Nonetheless it does somewhat limit the usefulness for homes without smartphones or with spotty Internet connections, or those that simply don’t want to rely on smartphones for functionality.For these types of situations we would recommend utilizing an RF (Radio Frequency) Baby Monitor, which does not rely on WiFi capability in order to function. 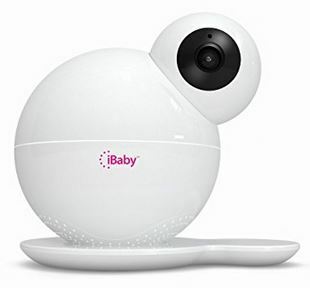 Our next item, the Infant Optics DXR-8 Video Baby Monitor, is just as feature-rich and highly recommended as this one, but is non-Wifi and has a dedicated handset. As mentioned before, this item is arguably just as feature rich as our top pick, just slightly different in that it does not utilize Wifi or a smartphone app, and instead is based on RF (Radio Frequency). Depending on your situation and/or preferences, this could be a better choice then the iBaby M6T. Overall this is an excellent choice for any family, especially those that don’t need or want to rely on Wifi or apps to utilize the monitor. Long Range – The RF Transmitter is reportedly useful up to 900FT away from the camera, which is a large difference compared to the 600FT other models provide. Depending on your situation, this may be helpful. Smaller homes and apartments probably won’t notice a difference though. Remote Pan/Tilt – Just like our top picks, this model allows for remote pan/tilt, so you can adjust the camera without having to go into the room and disturb the baby. 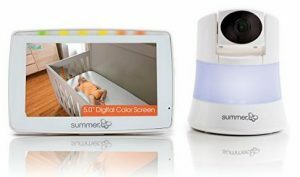 This honorable mention is the second iteration of Summer Infant’s Wide View product. 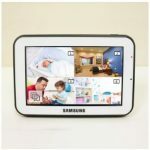 It’s main standout feature is the 5-inch digital color screen which boasts a wide angle view, allowing parents to keep an eye on a larger portion of a room. Large Monitor Screen – No one likes needing a pair of glasses just to make out the image on the monitor screen, and this model takes care of that with its large 5 inch, clear LCD screen. 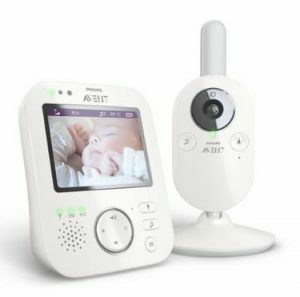 Rounding out our top 5 this year we’ve got the Philips AVENT SCD630/37. 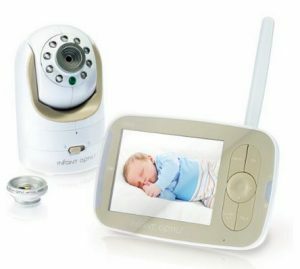 In terms of its features and functions it shares a little bit from our top picks (the iBaby M6T and the Infant Optics DXR-8) and is about the same price range as those as well (around the $200 range depending on where you shop). Range: 150 Ft Indoors, 900 Ft Outdoors. Temperature Sensor with Audio Alerts – One of the key features that this item shares with our top picks is the temp sensor. Parents (ourselves included) really like this feature, especially when houses have drafty windows or fluctuating heat in the home. Additionally this has an audio alert when temperature pass a certain range, so you don’t have to have your eye on the monitor to notice the change. Night Light and Lullabies – Another fancy feature that isn’t available on many nanny-cams or security cameras is the night light or lullabies. Some parents discount the music features of baby monitors, but we really appreciate them. FHSS Connection – It’s worth noting that this comes with a technical feature, FHSS or Frequency Hopping Spread Spectrum. It is essentially a way to insure that there isn’t any interference with other RF devices (like portable phones, etc). and that the connection is secure enough so no one can eavesdrop. No Pan/Tilt – This camera is a fixed camera and doesn’t feature pan/tilt at all. It is wall mountable, which means you can place it where most of the room is able to be seen, but it’s still lacking a feature that most parents seem to like. Reports of Background Noise – There are some users reports of background noise in the audio. Video seems to have not issues, however. As we mentioned before, this shares a lot of the features of our top picks (lullabies, temp alerts), but lacks some others (no pan/tilt). It does stand out with the inclusion of audio alerts, which many parents have reported are a better option then just visual alerts for temperature changes. All in all, this is a solid buy and could fit well in most all homes and situations.